"Brazilian revolution" redirects here. For other revolutions in Brazil, see Rebellions and revolutions in Brazil. Getúlio Vargas (center) and his followers pictured by Claro Jansson during their short stay in Itararé (São Paulo) on the way to Rio de Janeiro after a successful military campaign. Military confrontations mainly in the states Rio Grande do Sul, Minas Gerais, Paraná, Pernambuco and Paraíba. The Revolution of 1930 (Portuguese: Revolução de 1930), also known as the 1930 coup d'état was an armed movement led by the states of Minas Gerais, Paraíba and Rio Grande do Sul, culminating in a coup. Known as the Coup of 1930, the revolution ousted President Washington Luís on October 24, 1930, prevented the inauguration of President-elect Júlio Prestes, and ended the Old Republic. In 1929, leaders of São Paulo broke the alliance with the mineiros (i.e. people from Minas Gerais state), known as the "coffee with milk policy" ("política do café-com-leite" in Portuguese), and indicated the paulista Júlio Prestes as a candidate for the presidency. In response, the President of Minas Gerais, Antônio Carlos Ribeiro de Andrada, supported the opposition candidate from the south, Getúlio Vargas. On March 1, 1930, elections for President were held and victory was won by the government's candidate, Júlio Prestes, who was the president of São Paulo state. However, he did not take office because the coup was triggered on October 3, 1930; he was instead exiled. Getúlio Vargas assumed the leadership of the provisional government on November 3, 1930, a date that marks the end of the Old Republic. The crisis of the Old Republic extended throughout the 1920s. The political leaders of the Old Republic had been losing strength due to the mobilization of the industrial worker, influenced by the Nazi and Fascist revolts and political schisms that weakened other major oligarchies. These events threatened the stability of the traditional rural alliance between the states of São Paulo and Minas Gerais - i.e. the "coffee with milk policy". In 1926, the fourth and final dissent arose within the Paulista Republican Party (PRP). The dissidents were led by Dr. José Adriano de Marrey Junior. He founded the Democratic Party (PD), which, among other reforms, advocated a program of higher education as well as the overthrow of PRP power. This political crisis originated within the Freemasons, chaired by Dr. José Adriano de Marrey Junior. As such, São Paulo was divided during the elections of 1930. However, the greatest sign of wear of the Old Republic was overproduction of coffee during the crisis of 1929, fueled by the government through constant price increases. So in 1930, São Paulo and Rio Grande do Sul, which entered a civil war in 1923, were now united under the president of Rio Grande do Sul, Dr. Getulio Vargas, who united the PRR and the Liberator Party. In Juiz de Fora, Minas Gerais, the Mineiro Republican Party (PRM) was in opposition, and formed the Liberal Alliance with progressive political parties of other states. They supported Gaucho Getúlio Vargas for the presidency with the politician João Pessoa Cavalcanti de Albuquerque as a candidate for vice president. Minas Gerais was also divided, unable to generate a consensus for the presidential nominee. Part of the PRM supported the candidacy of Getúlio Vargas. But the "Conservative Concentration" of the PRM, headed by Vice President of the Republic, Fernando de Melo Viana and Justice Minister Augusto Viana do Castelo, supported Dr. Júlio Prestes for the official candidacy of the presidential elections held on 1 March 1930. During the Old Republic (1889–1930), the "coffee with milk policy" was enforced, which was supported by politicians in São Paulo and Minas Gerais. They alternated in the presidency but were not necessarily Paulistas or Mineiros or their nominees. However, in early 1929, Washington Luís indicated Júlio Prestes to be his successor in a move to be supported by presidents of 17 states. Only three states denied supporting Prestes: Minas Gerais, Rio Grande do Sul, and Paraíba. Politicians from Minas Gerais expected Antonio Carlos Ribeiro de Andrada, then the governor of the state, to be named by Washington Luís as presidential candidate. Thus the "coffee with milk policy" came to an end and the opposition began articulating a position against the 17 states to elect Júlio Prestes as President. Minas Gerais, Rio Grande do Sul, and Paraíba joined the political opposition from several states, including the Democratic Party of São Paulo, to oppose the candidacy of Júlio Prestes, forming the Liberal Alliance in August 1929. On September 20 of the same year, the Liberal Alliance launched their candidates for the presidential elections: Getulio Vargas as candidate for President and João Pessoa Cavalcanti de Albuquerque as candidate for Vice President. Intellectuals supported the Liberal Alliance, such as José Américo de Almeida and Lindolfo Collor, members of the urban middle classes and the political & military power called "Tenetismo"; they organized the Paulista Revolt of 1924, punctuated by Cordeiro de Farias, Eduardo Gomes, Siqueira Campos, João Alberto Lins de Barros, Juarez Távora, Miguel Costa, Juraci Magalhães and three future presidents of the Republic, Geisel, Médici and Castelo Branco. The elections were held on March 1, 1930 and gave victory to Júlio Prestes, who received 1,091,709 votes against 742,794 given to Getúlio Vargas. Notoriously, Vargas had almost 100% of the votes in Rio Grande do Sul. The Liberal Alliances refused to accept the validity of the elections, claiming that Prestes' victory was due to fraud. Moreover, representatives elected in states where the Liberal Alliance led the vote failed to obtain recognition of their mandates. This led to a conspiracy, based in Rio Grande do Sul and Minas Gerais. The conspiracy suffered a setback in June with Luís Carlos Prestes. A former member of the "Tenetismo" movement, Prestes adopted the ideas of Karl Marx and began to support communism. After some time, this led to the failed attempt at a communist overthrow by the Liberal Alliance. Soon thereafter, another setback to the conspiracy occurred as Siqueira Campos died in a plane crash. On July 26, 1930, João Pessoa was assassinated by João Dantas in Recife for political and personal reasons. This became the flashpoint for armed mobilization. João Dantas and his brother-in-law & accomplice, Moreira Caldas, were found beheaded in their cell at the House of Detention (today the House of Culture) in 1930. Accusations of fraud and arbitrary throat-slashing of Mineiran representatives and the bench of the Liberal Alliance of Paraíba, popular discontent due to the economic crisis caused by the Great Depression of 1929, the murder of João Pessoa, and the disruption of the "coffee with milk policy" were all factors in creating a favorable climate for revolution. Getúlio Vargas in a moment of relaxation. The 1930 revolution began in Rio Grande do Sul on October 3 at 5:25pm. Osvaldo Aranha telegraphed Juarez Távora to communicate the beginning of the Revolution. It spread quickly through the country. Eight state governments in the northeast of Brazil were deposed by revolutionaries. On the 10th of October, Vargas launched the manifesto, "Rio Grande standing by Brazil" and left, by rail, towards Rio de Janeiro, the national capital at the time. It was expected that a major battle would occur in Itararé (on the border with Paraná), where the federal troops were stationed to halt the advance of the revolutionary forces. These revolutionary forces were led by Colonel Góis Monteiro. However, on October 12 and 13, the Battle of Quatiguá took place (possibly the biggest fight of the revolution), although it has been little studied. Quatiguá is located to the right of Jaguariaíva, near the border between São Paulo state and Paraná. The battle did not occur in Itararé since the generals Tasso Fragoso & Mena Barreto and admiral Isaiah de Noronha ousted Washington Luís on October 24 and formed a joint government. 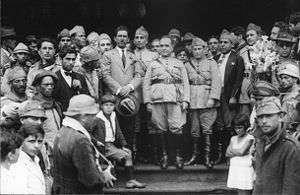 Vargas (center; in uniform), next to his wife Darci Vargas (second right), in the Catete Palace, after his arrival in Rio de Janeiro, 31 October 1930. At 3pm on November 1, 1930, the junta handed power and the presidential palace to Getulio Vargas, ending the Old Republic and knocking down all state oligarchies except for mining and those from Rio Grande do Sul. At the same time, in downtown Rio de Janeiro, the gaúcho soldiers fulfilled the promise of tethering horses to the obelisk on Rio Branco Avenue, symbolically marking the triumph of the Revolution of 1930. Vargas became head of the provisional government with broad powers. The constitution of 1891 was repealed and Vargas came to rule by decree. Vargas named intervenors to all state governments with the exception of Minas Gerais. These stakeholders were mostly lieutenants who participated in the revolution. What they do not understand is that a nation like Brazil, after more than a century of constitutional life and liberalism, could regress to a dictatorship without brakes and without limits like that which degrades and disgraces us before the civilized world! John Alberto serves as an example: If, as a military man deserving respect, as a public figure he does not deserve the even smallest compliment. Demonstrated by unexplained maneuvers and circumstances not yet clarified, the head of the most important state in Brazil proved to be an extraordinary case: remarkably incompetent and creating, in one year in office, one of the most tragic confusions in memory in the political life of Brazil. Also giving rise to a serious economic impasse (deficit of 100,000 accounts), and the deepest unpopularity against the "October Revolution" ... and provoked in the people in São Paulo, a state of misunderstanding and dangerous soul. Our history has no record of another period of failure as complete as that of "untrained lieutenants"! The effects of the revolution were slow to appear. The new constitution was approved only in 1934, called the 1934 Constitution, after strong social pressure from the Constitutionalist Revolution of 1932. But the structure of the Brazilian State was profoundly modified after 1930, making it more suited to the economic and social needs of the country. A hurried constitutionalization, out of time, presented as a panacea for all ills, translated into a political organization formed of personal influences and factious partisanship, divorced from existing realities. Repeating the mistakes of the 1891 Constitution and aggravating them with pure legal inventions, some backwards and promoting exotic ideologies. The events took it upon themselves to fix this early maladjustment! From the 1937 Constitution, the authoritarian centralized regime (known as the Vargas Era) stimulated the expansion of urban activities and shifted the axis of productivity from agriculture to industry, laying the foundations of modern Brazil's economy. Any observer with common sense cannot escape the evidence of the progress we have achieved in the short period of 15 years. We were, before 1930, a weak country, divided, threatened in its unity, culturally and economically retarded, and today we are a strong and respected nation, enjoying credit and treated as equals in the concert of world powers! Three former ministers of Getúlio Vargas were later elected to the Presidency: Eurico Dutra, João Goulart and Tancredo Neves. The latter did not actually take the job, because on the eve of the inauguration, he suffered severe abdominal pain during a religious ceremony at the Don Bosco Shrine; later diagnosed as a "diverticulitis", it ultimately led to his death on April 21, 1985, in São Paulo. Three of Vargas' 1930 lieutenants were later elected to the Presidency: Humberto de Alencar Castelo Branco, Emílio Garrastazu Médici and Ernesto Geisel. Former lieutenant Juarez Távora was runner-up in the presidential elections of 1955. Also, former lieutenant Eduardo Gomes, was runner-up in the 1945 and 1950 elections. Both were candidates for the UDN (Democrat National Union) party, which also shows the influence of Vargas' policies in the UDN party. The UDN party also had ex-lieutenant Juraci Magalhães, who was almost presidential candidate in 1960. Political parties founded by Getúlio Vargas, the PSD (Social Democratic Party - who were ex-party members of the "New State" and interventionists in the economy) and former PTB (Brazilian Workers Party), dominated the political scene from 1946 to 1964. The PSD, UDN and PTB were the major political parties of that period, and were led by Mineiros (PSD and UDN) and Gauchos (PTB). 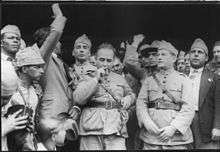 Despite the fact that fifteen years (1930-1945) are not a long time when it comes to political career, few politicians of the Old Republic managed to resume their political careers after the fall of Vargas in 1945. Post-1945, the policy framework was almost complete revised, both in terms of people as well as politics. In the Old Republic, the elections were false, but the representation was true... The elections didn't count, but the deputies and senators were the best we could have! The 1930 deal made by politicians from São Paulo was bleak: they complained that, after Julio Prestes in 1930, no citizen born in São Paulo was elected and held the Presidency except, and only for a few days, Ranieri Mazzilli, Dr. Ulysses Guimarães and Michel Temer. The Paulistas also complained that only João Figueiredo reached the presidency (in 1979) as someone committed to the ideals of the 1932 revolution. Figueiredo was the son of General Euclides Figueiredo, the commander of the constitutional revolution of 1932 and who had been exiled to Argentina between 1932 and 1934. João Figueiredo created the "opening policy" of the military regime. Vargas was the first in Brazil to use personal advertisements on a large scale - the so-called cult of personality, with the Voice of Brazil - typical of fascism and predecessor to modern political marketing. The elite-proletariat alliance created by Vargas became standard in Brazilian politics, such as the PSD-PTB Alliance backed by the clandestine PCB (Brazilian Communist Party). ↑ Fausto, Boris (1972). A Revolução de 1930: historiografia e história. São Paulo: Brasiliense. ↑ "A Revolução de 1930: Principais fatos da Revolução de 1930"
↑ "A Revolução de 1930 (Resumo)"
↑ "Revolução de 1930 - História do Brasil"
↑ AMADO, Gilberto, Presença na Política, Livraria José Olympio, Publisher, 1960.